Virginian seafood is famous all along the east coast for being fresh, crisp, and delicious. Easy access to large bodies of water, including the Atlantic Ocean and the Chesapeake Bay, makes for delectable delights throughout the state. With so much competition, you’ve got to have something special to make it on a top ten seafood restaurant list. Without further ado, here are our picks for ten of the best seafood restaurants in Virginia! To be honest, we could compile a list of excellent seafood restaurants in Virginia Beach alone! In a city defined by its incredible seafood selection, Tautog’s Restaurant at Winston’s Cottage stands out. 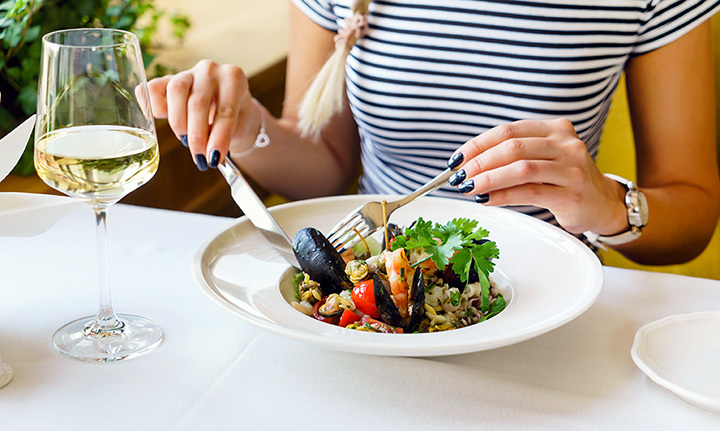 Located in a picturesque cottage along the beach, Tautog’s offers fresh seafood served by “the friendliest people in town.” Weekly additions incorporate the latest catch to the menu. Dinner service starts at five and make sure to check their website for the live music schedule. Dock of the Bay Seafood Restaurant in Portsmouth, Virginia, serves up fresh seafood platters at their dockside location. Winner of last year’s Virginian Pilot “Best Of” Gold Award, Dock of the Bay is known for their incredible views, family-friendly atmosphere, and reasonable prices. The award-winning Black Pelican Seafood Co. in Chesapeake, Virginia, has delighted visitors since for over two decades. The chef is a local news frequenter, teaching viewers how to cook seafood dishes. Daily specials keep the menu fresh. In addition to their fresh seafood, Black Pelican serves award-winning wood fire cooked pizza, offering an option to those that aren’t as inclined toward the sea. The original Black Pelican was featured on the TV show “Diners, Drive Ins, and Dives,” and this second location aims to replicate the success of the first. Captain Groovy’s Raw Bar and Grill is aptly named. The atmosphere is, in a word, grooving. The atmosphere is casual with an emphasis on relaxation. Groovy’s serves brunch, lunch, and dinner with specials every day of the week, including discounts for military on Mondays and regularly rotating chef specials. The menu is varied with options for those that don’t like seafood, but the real star is the oyster raw bar. Croaker’s Spots, in Richmond, Petersburg, and Norfolk, represent “The Soul of Seafood.” Harnessing the power of Harlem, Croaker’s is a recreation of an original restaurant in New York. The servings are large, the food full on southern comfort, and the atmosphere Southern charm. Local musicians play regularly. The seafood, of course, is to die for. Coastal Flats has three great locations in the Northern Virginia area and offers fresh seafood in a maritime environment. Their “World Famous Lobster Roll” is the star of the show, but don’t skip out on their plethora of incredible entrees. Stop by for lunch or dinner, but be prepared to wait during main meal times. Food this good is worth it. The Washington Post had this to say about Ford’s Fish Shack: “Fish Shack is a catch for Ashburn residents. Crab cakes and lobster rolls stand out.” For the last seven years, Ford’s Fish Shack has served the Ashburn and South Riding communities in Virginia with fresh food, seasonal specials, and microbrews, all while collecting accolades from Zagat and Northern Virginia Magazine. The Fish Shack proudly supports charities including Autism Speaks, No Kid Hungry, and American Cancer Society’s Relay for life, among others. Feel good about your food and eat well at Ford’s Fish Shack. RT’s Restaurant in Alexandria, Virginia, brings a Cajun flair to tradition seafood. Specialty menu items include the Jack Daniel’s shrimp, spicy she-crab soup, Cajun veal oscar, and crawfish etoufee. Since opening over 30 years ago, RT’s has been a regular inclusion on Washingtonian Magazine’s “Top 100 Restaurant” list and on Zagat’s list of top seafood restaurants. Make sure to make a reservation before stopping by. PassionFish is one of the best restaurants in Northern Virginia. Just ask the Washington Post, the Washington City Paper, Northern Virginia magazine, Eater DC, National, or The Washingtonian. Whether you’re looking for a kid-friendly restaurant with fun yet understated nautical themes or incredible local oysters, PassionFish is the place. Their dedicated sushi chef brings an oriental flair to the menu. Clare and Don’s Beach Shack is an all-around solid, family-friendly seafood experience. The menu has vegetarian, gluten free, and vegan options, in addition to a little bit of turf and a whole lot of surf. The restaurant has become a community focal point, with regular boardwalk trivia, boardwalk karaoke, and live music. The atmosphere is fun and light and the food will keep you coming back. The Island House Restaurant in the town of Wachapreague, Virginia along the Eastern Shore is a seaside sensation. The 200-seat restaurant overlooks the Wachapreague harbor, offering scenic views along with its delicious, fresh-caught seafood. The restaurant serves lunch, dinner and party platters. The award-winning crab cakes are a must.